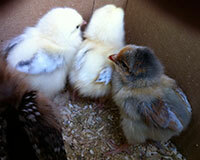 We have a flock of beautiful hens, born in Santa Cruz in the spring and summer of 2011. They are happy girls, who eat high quality organic feed and forage in our organic garden. We would love to share their healthy, good Omega 6 eggs with you. 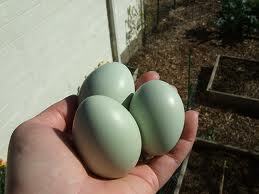 Our Americana hens lay the eggs with the blue-green shells, which are said to be the best for good cholesterol. We also have white, brown, lavendar, and speckled eggs from our beautiful hens. Fresh eggs are available through the Westside Neighbors Egg Co-op! A donation of $7.50 per dozen eggs will help with the cost of feeding our beautiful girls their high quality organic diet. 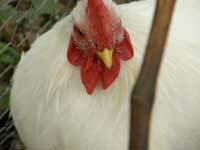 We feed Modesto Milling Organic Layer Pellets, plus Modesto Milling organic chicken scratch. In addition, our hens forage in our organic garden on borage, comfrey, mustard, arugula, mint and other nutritious greens and happy bugs. If you would like more information, or would like to join our Westside Neighbors Egg Co-op, please email us or phone 831.423.2824. Fresh eggs are available to everyone by the half dozen or dozen. If you wish, you can also join the Co-op for a donation of $15 or more to help care for our girls, pay for their high quality feed, and quarante that you will have first pick of the eggs when demand is high. You can bring your kids and collect eggs straight from the coop! Our hens are tame, and nice to hold.